I have not posted on my blog in a while but given that this is fitting is oddly fitting. As I am writing this my grandfather is moments away from passing. He has been very influential in my life; he was the one who first introduced me to fixing computers in the early 1990’s. He started my spark of curiosity of technology. For those of you who know me well, know I am obsessed with learning and using technology. He also was always excited about fixing things and tinkering. He was an avid craftsman, and built many pieces of furniture. By trade he programmed/ran/maintained CNC mills and he was the best in his company at it. I’ve had a missed opportunity, so many times I could have thanked him for all the inspiration and knowledge he imparted on me. He is too far gone for me to say my final farewell, his breathing very faint and sporadic. So this post has to suffice. A parting note, please take a moment and thank the people in your life who have inspired you. They are few and far in between. Today is your day to change. When was the last time you seriously thought about that? Take a minute to think about that. If you are doing good, it feels great. If not, maybe you are ready for change. 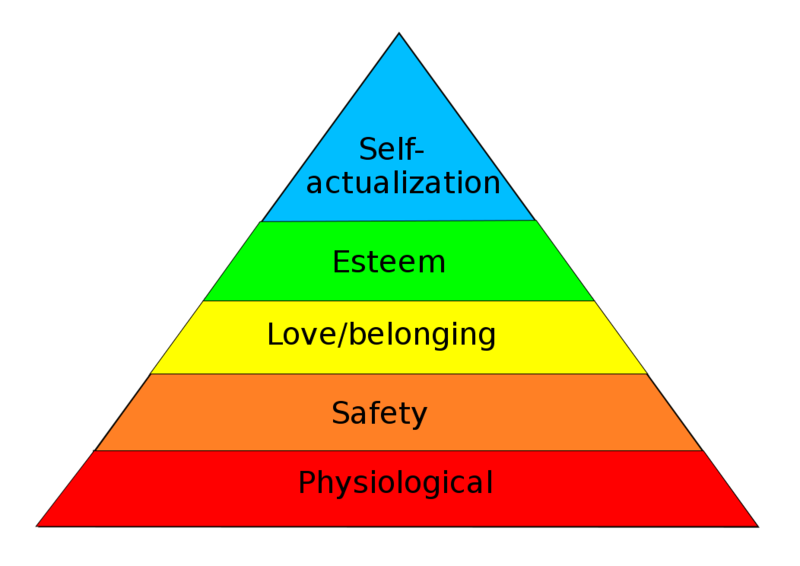 At the base, these are basic things everyone needs, as you go up the pyramid, they are less necessary (but they do add to happiness. Now say you have one of those bottom items – physiological or safety – gets taken away, what happens? Well, everything above it quickly goes away. What can you do? You have to rebuild your pyramid. Lee Iacocca once said “The thing that lies at the foundation of positive change, the way I see it, is service to a fellow human being”. There is unconventional wisdom in this. Sometimes your perception of a situation is wrong, especially when you take some time and help someone who needs your help. If you are truly convinced that is not the issue, replace what is causing your issue. So how do you do that? When do you do that? These are tough questions. For me, anytime I have made a large change, I was scared and excited. I CHOSE to just be excited. The fear is a good thing, it keeps you on your toes, so you will succeed in what you do. When do you make that change? I would say, when fear of the unknown is outweighed by the problem you are facing. Here is a great podcast worth listening to on the subject. The bottom line, take care of yourself. For every bad situation, there is a positive one to replace it. The good news in my world is my software, BookSmarts, was reviewed. I didn’t really know it happened, but Softpedia reviewed it. To tell you the truth, this sort of thing can be nerve-racking especially if you know ahead of time that they are going to review your work. In my case, I’ve been working on it for the past two years. The surprise moment when you see a review of your work makes time stand still and your heart starts beating harder. When someone is working on something for two years without seeing a dime, it becomes their baby. I am now sure I know what the mother’s on Toddlers & Tiaras are experiencing. You have got this thing out there for the world to see, your baby, and people are criticizing or praising it. Trust me, as a parent, no one ever likes it if you call their baby ugly. Go ahead, I dare you to say that to a mom you know, see how it goes. You probably won’t be able to say that again without a lisp, because she knocked out your front teeth. Luckily for me, I apparently have pretty baby, it got an excellent first review. It was an affirmation of my time and effort, as well as all those around me who have supported me through this intrepid endeavor. It is a reward, in a sense, for the effort. Yes, it is ultimately making money is proof of success, but this is a nice place to be in on the path to success. It is now exceptionally easy to lose weight, thanks to these two apps. First, and in my opinion the most important is the LiveStrong Calorie Tracker. This app is available as a website or an app for your phone, even Windows Phone 7. You can enter in many different kinds of foods listed in their database or enter your own. Also keep track of your workouts. At the end of the day, if you have calories left over you will lose weight, simple as that. The other is Nike+. Keep track of your workouts, set goals, and get coaching advice from Nike’s website. That is the technology behind weight loss. The other half of it is setting goals. For myself I have a life long goal to watch my children grow up and have children of their own. That is my underlying motivation. I also have shorter goals, lose two pounds this week or run 2 miles in 15 minutes. All in all, I’ve lost 20 pounds so far, halfway to my goal, and a lifetime of maintenance. I have noticed that I am much happier now and feel better too. Start enjoying life.